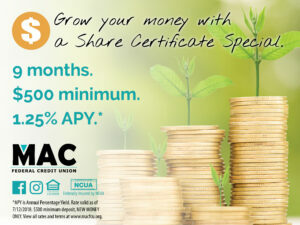 MAC is here to help you grow your credit and your savings! A great place to start would be with this short-term $500 minimum Share Certificate Special. Visit our website to see other share certificate terms with rates up to 2.80% annual percentage yield. From beginning investors to pros, we have options for everyone! Be sure to call or visit today to grow your money tomorrow!